Leading carmakers are relying on proven paint defect inspection using the reflectCONTROL Automotive system. 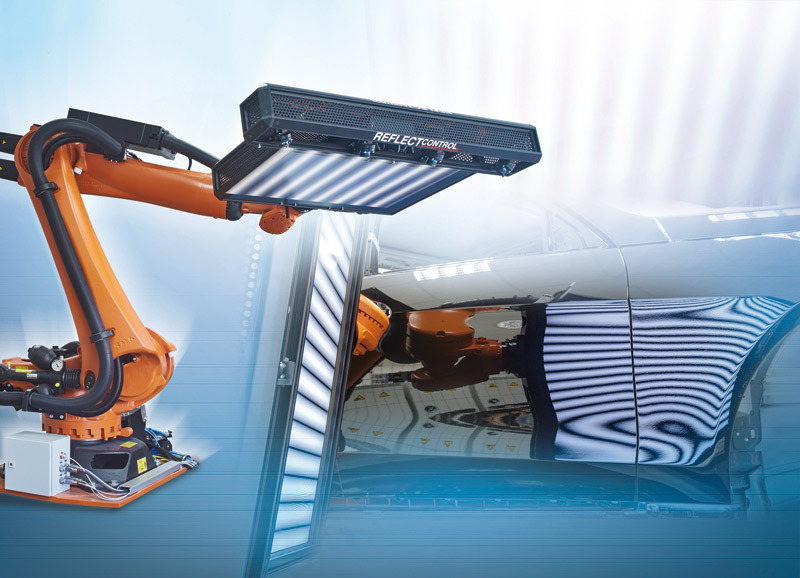 In its Sindelfingen plant, Daimler relies on robot-based solutions for automatic paint defect inspection and marking. There, all models (up to 1,800 vehicles per day in three parallel lines) are inspected according to strict criteria by Daimler and marked for processing. In addition, carmaker BMW, who has already ordered the second system for its factory in Munich, also places its trust in systems from Micro-Epsilon. reflectCONTROL Automotive has now also crossed the Atlantic: from now on, Honda has opted for high-tech from Germany in its new paint shop in Marysville, Ohio. Particularly in the automotive industry, very high requirements are being placed on quality assurance. Due to highly reflective surfaces, traditional approaches of image processing have quickly reached their limits. Here, reflectCONTROL Automotive offers a tailor-made solution. All systems are equipped with specially designed, robot-based sensors. Robots enable a flexible adaption of the measurement procedure to different shapes of bodywork, all bodywork areas are detected with equally high detection performance. The system is integrated into the processing line. Micro-Epsilon provides experienced advice and guidance when it comes to installations in Greenfield and Brownfield plants. Resolutions in the range of tenths of a millimetre enable the precise detection of almost all defects in the base paint and top coat in a three-dimensional form and position on the bodywork surface such as inclusions, fluffs, paint drops, scoring or craters. The sensitivity in the third dimension (height, depth of the defect) is in the sub-micron range. Mature supporting software tools allow the set up of different model types with appropriately trained personnel. The measuring principle is based on the phase-shifting deflectometry principle which is similar to that of the human eye. A light source integrated in the sensor generates an alternating striped pattern with sinusoidal intensity onto the vehicle. Defects cause deviations in the striped pattern which is mirrored by the surface and recorded by cameras and evaluated by software. The evaluation of several single frames enables a concise surface representation that is inspected for deviations from the ideal surface using robust algorithms. Compared to visual inspection, robot-guided defect detection provides significantly more consistent, precise results. Field experience has shown a significant reduction of defect slippage in the downstream processes, while issues such as tiredness, color dependency or daily mood swings no longer have any influence. The detected data can be used further, e.g. for monitoring tasks, to reveal sources of errors and to optimize previous production processes, or for a marking robot that automatically marks the defects for subsequent repairs or rework.